In honor of Women’s History Month, the EJ IWG is focusing on the central role women have played in the environmental justice movement along with the challenges still facing them today. Since the inception of the EJ Movement in the US, women have played a critical role in advocating for overburdened and underserved communities. Women have led the way in organizing their communities, churches, and schools to improve public health and revitalize local neighborhoods. Given the essential contributions of women to the EJ movement, it is vital that environmental justice practitioners begin to articulate environmental inequalities that specifically impact women and develop interventions to effectively target women. In this webinar, we will lift up pioneering women who helped establish environmental justice within the Environmental Protection Agency and provide a framework to begin to understand some of the challenges that are facing women in the context of environmental justice. The webinar will also highlight organizations that are carrying out projects aimed at providing resources, training, capacity building and other assistance to women. Additionally, the webinar will discuss the representation of women in environmental organizations that are making decisions that impact overburdened and underserved communities. Subscribe to the EPA’s Environmental Justice Listserv (https://lists.epa.gov/read/all_forums/subscribe?name=epa-ej) to receive registration information for upcoming webinars and activities! The EJ IWG is hosting the Access & Awareness Webinar Series to provide public with access to the working group and to increase community awareness of federal agency environmental justice strategies and holistic community-based solutions to address environmental justice issues. This series will help the public gain a deeper understanding of how federal agencies are collaborating and what resources are available to anyone interested in improving the health, quality-of-life, and economic opportunities in overburdened communities. We are excited to report that the first public hearing on the diesel pollution reduction bill (SB 1008) went very well! I testified (you can read my testimony here) along with some of our terrific partners who made a strong case for taking swift action to cut diesel engine pollution across Oregon. On the day of the hearing, two Multnomah County Commissioners – emergency room doctor Sharon Meiren and Jessica Vega Pederson – authored an outstanding guest opinion piece in The Oregonian that I hope you will read and share with your network – here’s a link to it. They really make the public health case for solving this problem now. Also, we want to highlight two clean air activists who also testified in the hearing, one about her son’s asthma (which of course is exacerbated by air pollution), the other to hand deliver 3,000 signatures from Oregonians all over the state asking our state legislature to take action on diesel engine pollution now. Haven’t signed yet? You still can! Just click here. Identify your state representatives if you don’t already know them by entering your address here. 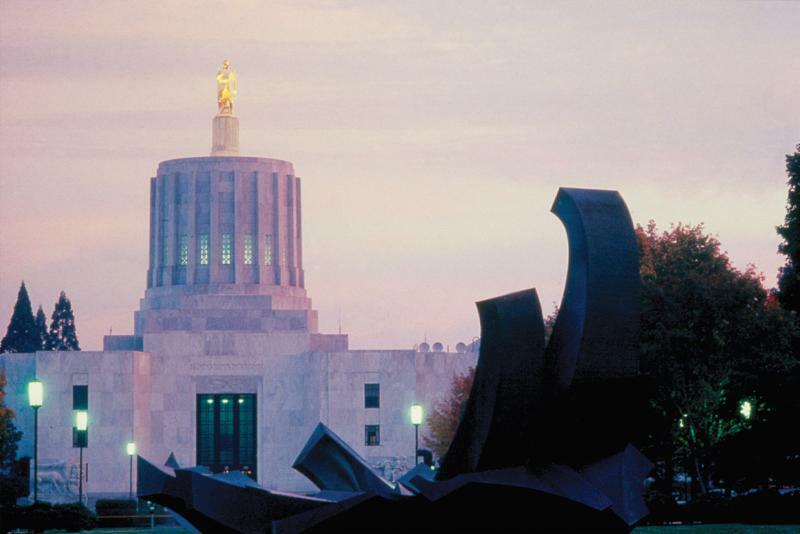 Their mailing addresses in the state capitol will be included, but to make it easy, this one will work for all three: Name & Title, Oregon State Capitol, 900 Court Street NE, Salem, OR 97301. While we believe we can push this bill into a law this legislative session, we know we can’t do it alone. As is increasingly obvious these days, democracy is a sport, not an armchair. We invite you to get off the sidelines! These days there is a rarely a dull moment in the fight for clean air. In this week’s eNews we write to let you know about two local diesel pollution events, two important people, and three chances to speak up for clean air. We hope you are energized by all that is going on – we are! 3 CLEAN AIR EVENTS: 1 PAST, 2 FUTURE, ALL IMPORTANT! The first hearing on our priority issue was held this past week in the Senate Committee on Environment and Natural Resources. It was an informational hearing (ie no public testimony) where lawmakers listened to expert, invited testimony about the harmful health impacts of diesel pollution. Two members of the five-person committee unfortunately did not attend: Senators Alan Olsen (R-Canby) and Herman Baertschriger (R-Grants Pass). The hearing audio will be available soon; listen here. Every year in Eugene, environmental lawyers who work for the public interest gather in Eugene to learn, connect, and share resources so they can all return to their desks and fight the good fight a little smarter. This year, we are proud that our staff attorney Nick Caleb will be on a panel along with several colleagues from the impressive Crag Law Center of Portland to update folks about Oregon air law and regulations. If you’re not planning to attend, you can catch it all online. More here. 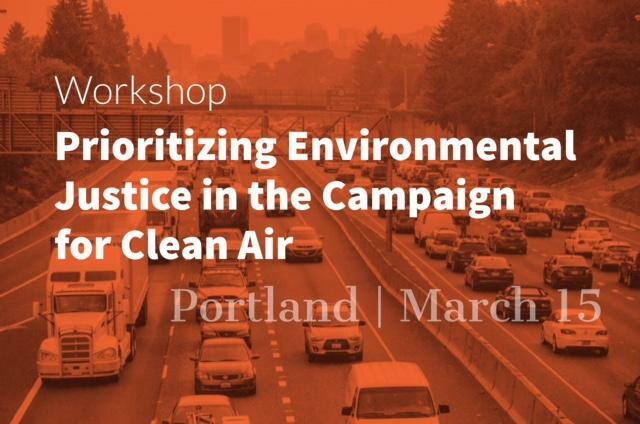 We are very pleased to be co-hosting an all-day workshop in Portland to bring clean air partners together to better understand and prioritize environmental justice in our work. We’ll meet from 9 AM to 4:30 PM on Wednesday, March 15th. Speakers include Charles Lee, Senior Policy Advisor, US Environmental Protection Agency, Washington D.C. (EPA). Mr. Lee is widely recognized as a true pioneer in the arena of environmental justice, as the principal author of the landmark report, Toxic Wastes and Race in the United States. Details and registration right here. We welcome Richard Whitman to lead the Oregon DEQ, an agency that is ripe for inspired leadership with a commitment to environmental health. Mr. Whitman has served as Interim Director since Pete Shepherd, another Interim Director, moved on October 2016. More here about his appointment. We are hopeful that the agency will live up to what Oregonians need and want from it – namely better protection of our environment and our health, which are forever intertwined. We will push hard for it to be sufficiently funded to successfully carry out its work. Well, OK, we’re not feeling very welcoming, actually. All evidence suggest that Mr. Pruitt is no friend of the environment. In fact, his history as Attorney General in Oklahoma shows he was quite opposed to the kind of environmental protections that are essential for public health. With Pruitt in place at the national level taking direction from the anti-regulation Trump White House, it’s clear that states’ roles in environmental protection just got more important. So, while we won’t ignore what’s happening in Washington, DC, we will continue to target our work here at home where there is plenty of room for improvement. Here’s some background on Mr. Pruitt and his potential impacts on Oregon’s environment. 3 CHANCES TO USE YOUR VOICE FOR CLEAN AIR! Next Wednesday, March 8th our legislators will open the doors for a public hearing on a bill that would once and for all get rid of the dirtiest diesel engines polluting Oregonians’ health. Let’s show the Senate Committee on Environment and Natural Resources how many Oregonians want clean air, not dirty diesel pollution! We’re for clean engines and clean air! And together we CAN accomplish both.RSVP now! Email akash@whatsinourair.org. We’ll meet in the capitol rotunda at 2:45 PM. Share it with friends on Facebook. 2. Anytime | Tell your state representatives that you care about diesel pollution. In this moment, if you don’t yet know who your state representatives are, it’s time! Just enter your address here to identify them, then ring them right up and let them know you support clean, healthy air and would like them to cut diesel emissions this session, thank you very much! Already know them, great! Remind them who you are and that you, too, care about healthy air for all Oregonians and urge them to take action to cut diesel emissions. This type of direct contact from you really, really matters. Our great partners at the Oregon Conservation Network and Oregon League of Conservation Voters are co-hosting a lobby day for the environment later this month and we’ll be out strong for clean air. Can you join us? Find more info and how to signup right here. Phew! That’s a lot going on, isn’t it? And while we know from personal experience that the fight for clean air is a marathon, not a sprint, right now we’re definitely doing some sprinting! Thanks for being along for the ride. eNews 2.14.17 | Lobby Day. Intel. EJ Workshop. DEQ Director. Lobby Day for Clean Air at the state capitol this Wednesday, Feb. 15th from 10:30 AM till 1 PM (or 4 PM if you stay for the hearing). Join us to let our lawmakers know that #WeLoveCleanAir and expect them to take steps to make Oregon’s air healthier during the 2017 state legislative session. Details and sign-up right here. Intel Air Quality Advisory Committee (AQAC) meeting (also) on Feb. 15th from 6 to 8 PM. These committee meetings are essential to the success of the Good Neighbor Agreement (GNA) we forged with Intel to reduce its emissions for healthier local air. Showing up lets the Intel folks know that the community cares. Do you? Agenda and background here. New Oregon DEQ Director. The Oregon Environmental Quality Commission will hold a special meeting at1 PM on Tuesday, Feb. 14, 2017, to discuss and take action on the next steps in the DEQ director’s recruitment process . The meeting will be in the 3rd floor conference room at the DEQ headquarters, 700 NE Multnomah Street in Portland. For more information, including the “listen in” conference line for people who wish to connect by phone, please visit the meeting agenda page. Environmental Justice Matters: Save the Date for an EPA-sponsored workshop focused on bringing together government decision makers and EJ community groups to partner effectively to clean Oregon’s unhealthy air. Details here. These actions may not feel like a huge march or a 1,500-person town hall with a US Senator, but rest assured, this, too, is resisting and very much what democracy looks like. Really hope to see you at the state capital on the 15th! Neighbors for Clean Air is please to co-host this one-day workshop to build relationships among community members and federal, state and local agencies, and to develop a shared understanding of regional air quality issues and impacts to communities with environmental justice concerns. While the exact agenda is still being finalized, our focus is to come together to learn about air quality, diesel emissions, health impacts and tools to assess impacts that can help build capacity to work collaboratively to identify strategies to improve air quality in Oregon. People attending the workshop will leave with an enhanced knowledge of governing laws and rulemaking processes, which can help lead to more constructive engagement on areas for action. Government attendees will learn tools for meaningfully and effectively engaging with environmental justice communities on issues that matter to them. Our special guest speaker is Charles Lee, the Deputy Associate Assistant Administrator for Environmental Justice at the U.S. Environmental Protection Agency (EPA). Mr. Lee is widely recognized as a true pioneer in the arena of environmental justice, as the principal author of the landmark report, Toxic Wastes and Race in the United States. Learn more about Mr. Lee here. This workshop is a joint work effort of Environmental Protection Agency (EPA), Neighbors for Clean Air (NCA), Portland State University (PSU), Multnomah County (Mult Co), Oregon Department of Environmental Quality (ODEQ), and the Oregon Health Authority (OHA). The proposed attendees are local community groups; state, local, and federal agencies; tribal governments; PSU; and national experts. NCA and PSU will support additional workshops following this session. Space is limited, you can register here for the event.